These larger style 'slim' shirt/pocket leather wallets retail for over $220 in quality stores. Colours = black, brown, burgundy, tan, and one (1) only in brown 'croc' pattern as featured in the photos. An absolute practical SLIM pocket/shirt wallet. designed to carry the essential cards and bank notes necessary to get you through life. Sophisticated and practical, this multi-card holder carries notes, identity cards, driver’s license, and several credit cards. Easily slide into your shirt/pocket and provides easy access to its contents. 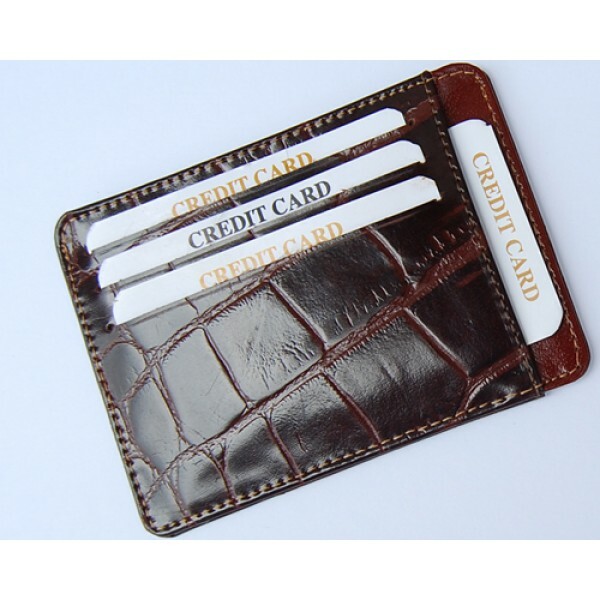 • Including a total of six (6) credit card slits, 3 in the front, and 3 on the back. You'll be amazed how much it can carry. An absolute beauty and a MUST for everyone.